Four rounds have completed in the MASUM 2015 Chess Competition, three more rounds to go. The fifth round has just started. So, let's see the team ranking in both categories - Men and Women, after Round 4. 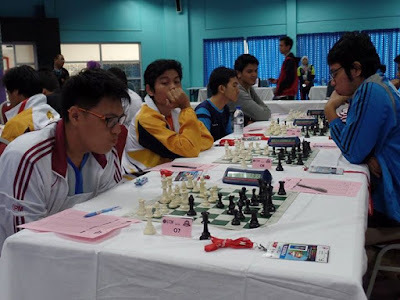 To GiLoCatur's knowledge based on "Peraturan Permainan Sukan MASUM" for chess, there are two events - Individual and Team, for each category. For the team event, the points are accumulated from all the four players in the Individual event from the same team which is university. In the Men category, there are 15 teams taking part. 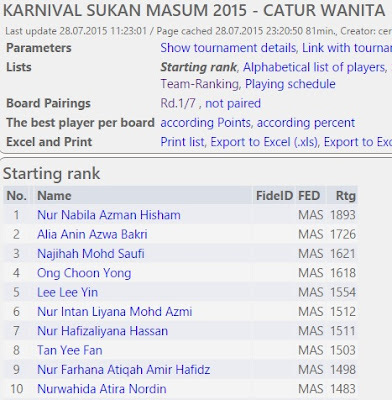 All the teams except Universiti Malaysia Sabah send the maximum four players. 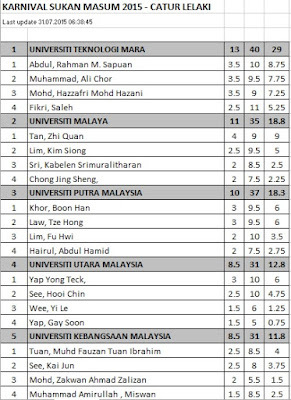 University Teknologi Mara team or UiTM which includes Fikri, GiLoCatur's eldest child, is leading the pack having 13 points. Trailing with 2 points is Universiti Malaya (UM) team. 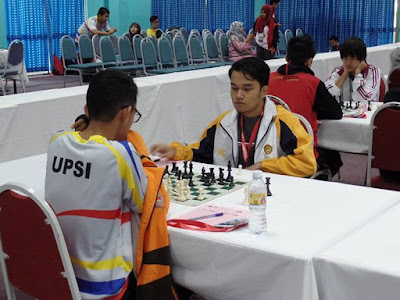 In the third spot is Universiti Putra Malaysia (UPM) team which includes Hairul Abdul Hamid, a Malaysian chess blogger with 10 points. In the Women category, there are 12 teams taking part. 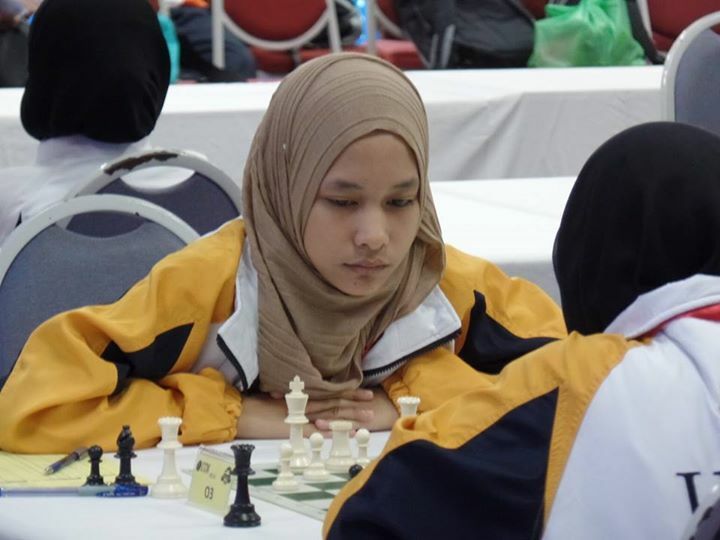 All the teams except both Universiti Sains Malaysia (USM) and International Islamic University Malaysia (IIUM) send the maximum four players. GiLoCatur is surprised with this fact. 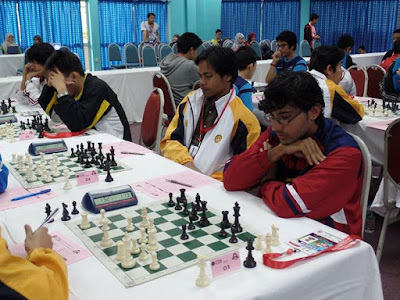 Both universities which have three players only taking part are strong contenders in MASUM chess competition. University Teknologi Mara team or UiTM which includes Nur Nabila Azman Hisham, a senior national women player, is leading the pack having 12 points. Nabila is leading her team with full 4/4 points. 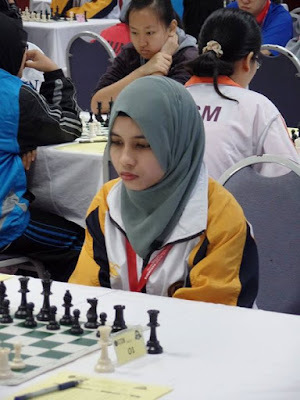 Trailing with 1 point is Universiti Malaya (UM) team which includes Alia Anin Azwa Bakri, a Women Fide Master and a senior national women player as well. In the third spot is Universiti Malaysia Pahang (UMP) team with 10 points. 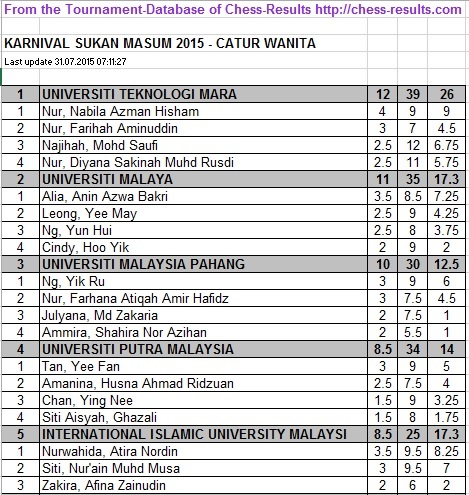 Can UiTM maintain its lead in both categories? We have to wait until all the last three rounds to complete. Below are the photos of some of UiTM players. The photos are from Nass Siro FB. Thank you to Dr Nasrul for sharing the photos of the MASUM 2015 Chess in the Facebook. All the Best to MASUM 2015 UiTM chess team. Hopefully, they can emerge as the champions and medallists! 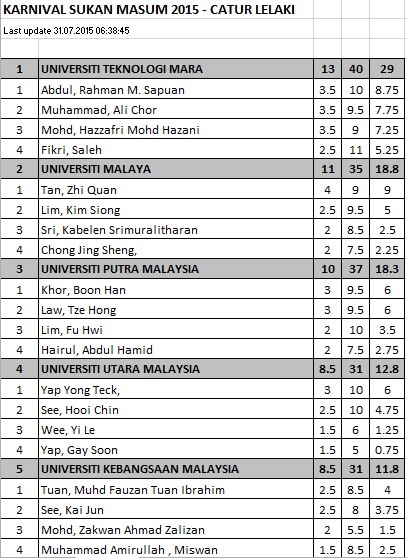 In the Men's category, three of the UiTM men players are among the Top 10 in the Starting rank. They are ranked second, third and fourth. In the Women's category, two of the UiTM women players are among the Top 10 in the Starting rank. They are ranked first and third. Today will be the first day for MASUM 2015. 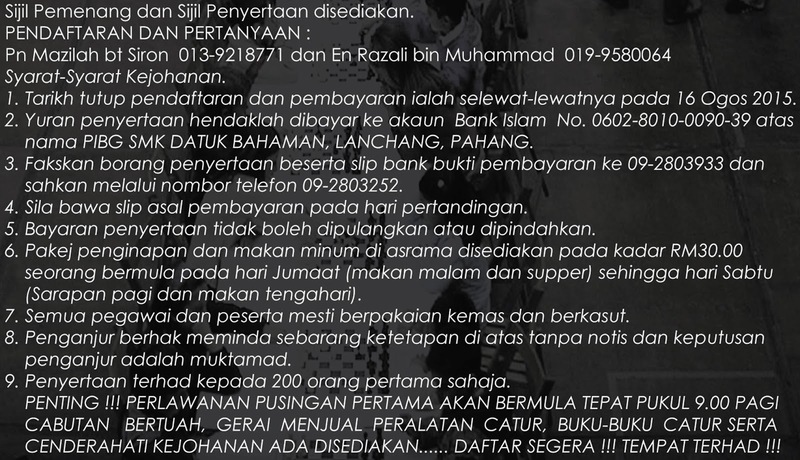 What is MASUM. 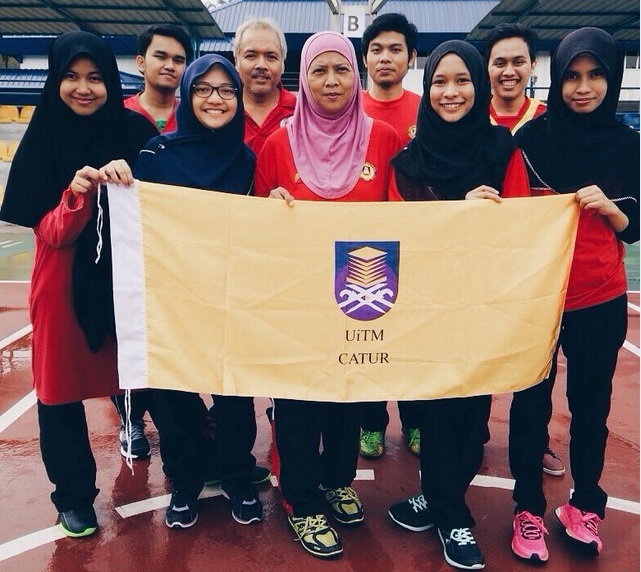 In English, MASUM is Malaysian Universities Sports Council. 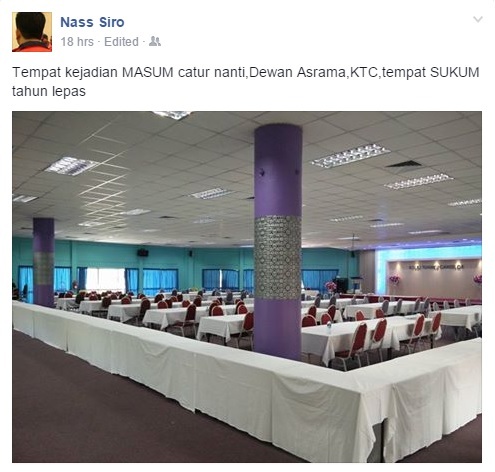 In Bahasa Malaysia, MASUM stands for Majlis Sukan Universiti Malaysia. 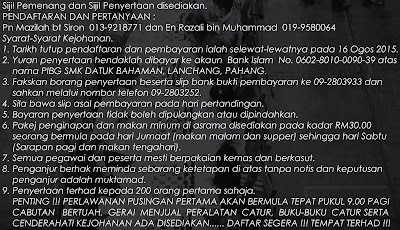 A bit history on MASUM. It began in 1975 after the first sports carnival among the staffs of Malaysian Universities was held a year earlier. In early years, the sports inter universities were held ad hoc. In 1981, GUM was created. 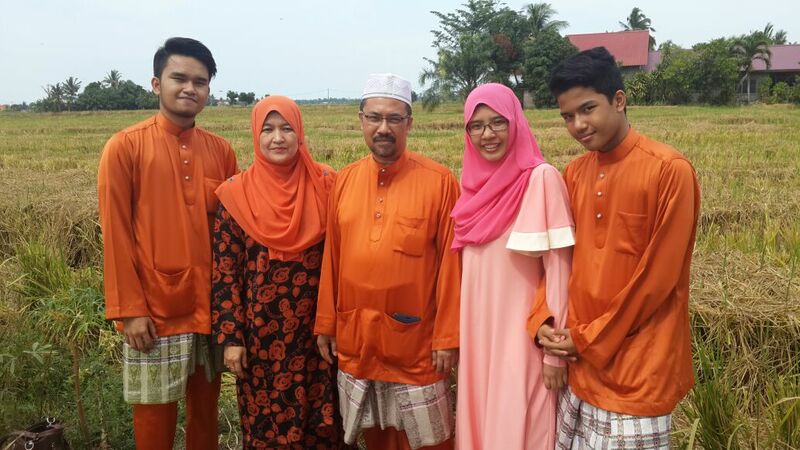 The name changed to MASUIPTIM two years later when finally it became MASUM in 1985. Today, there are 20 local universities which are the members of MASUM. 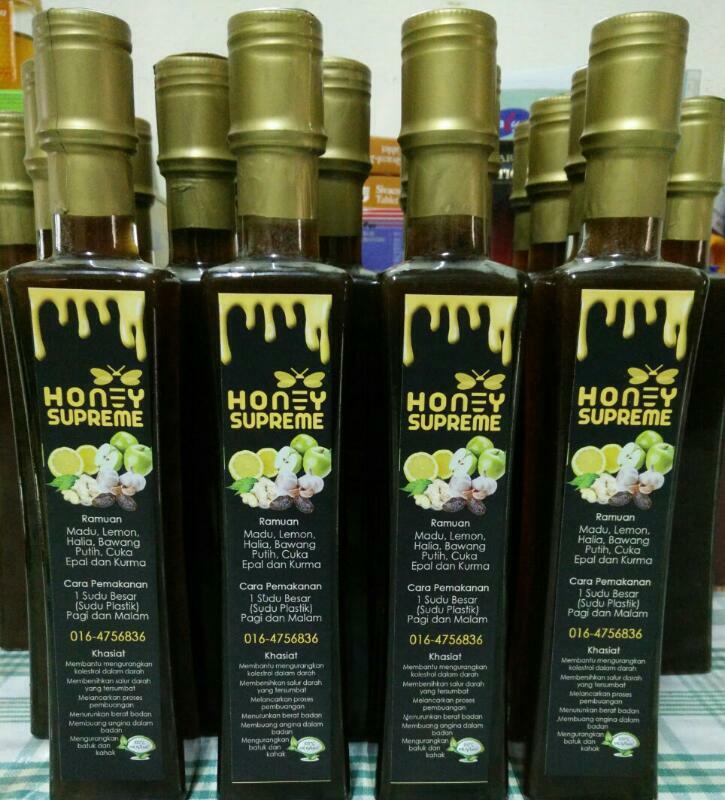 This year, MASUM is hosted by UTM, Johor Baharu. GiLoCatur is very glad since chess is one of the sports in the competition. The first round will kick off in about one hour from now. 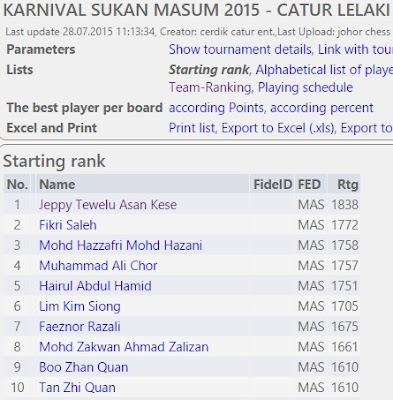 GiLoCatur will follow MASUM 2015 especially chess because GiLoCatur's eldest son, Fikri, will be participating. Fikri will represent UiTM. Below are the photos of the venue for the chess tournament, courtesy of Nass Siro FB. GiLoCatur would like to congratulate CM Fadli (below photo) on his appointment as an EXCO with the KLCA ie Kuala Lumpur Chess Association. 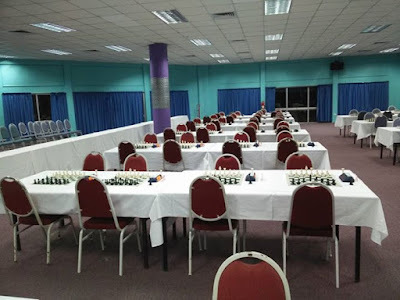 GiLoCatur notices that the chess association has new website / blog link - http://www.klcachess.blogspot.com/. GiLoCatur has to update the new link in GiLoCatur's Blog since the old website link is no more active. 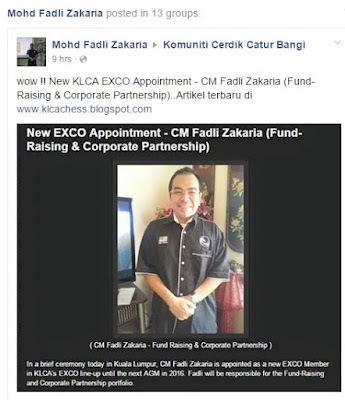 Wish CM Fadli as well as KLCA for great future for Malaysian chess. 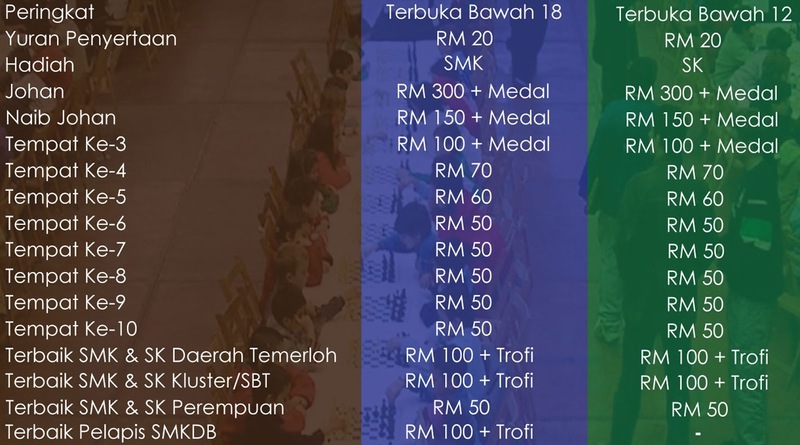 On behalf of SMK Datuk Bahaman Lanchang, GiLoCatur would like to invite you all to take part in a chess championship to be held on Saturday during the Malaysian Independence weekend. Click here to download the entry form and championship flyer. 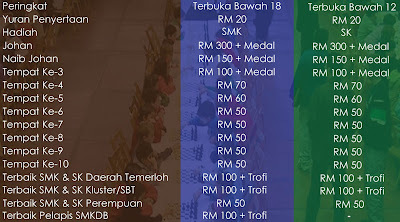 Dear Malaysian junior chess players & parents, hurry, hurry, register now!